You can use treated wood for a variety of projects including, but not limited to, decks, retaining walls, fences, fire-resistant applications and marine pilings. 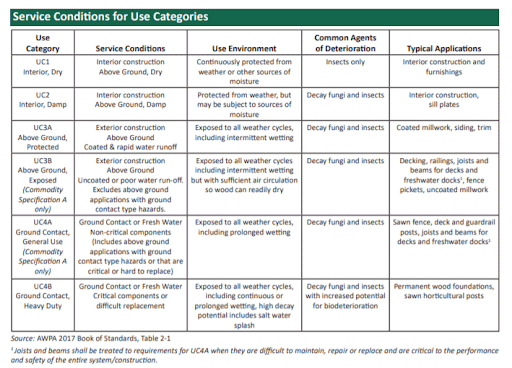 Treated wood is vital in many of these different applications because there are naturally-occurring fungi in the ground that attack lumber, so lumber destined to be used in the ground must be treated to a higher standard, or retention level, of fungi-resistant preservatives in the wood. The end tags on treated lumber will provide you with proper use designations. Look for Above Ground or Ground Contact on the end tag. 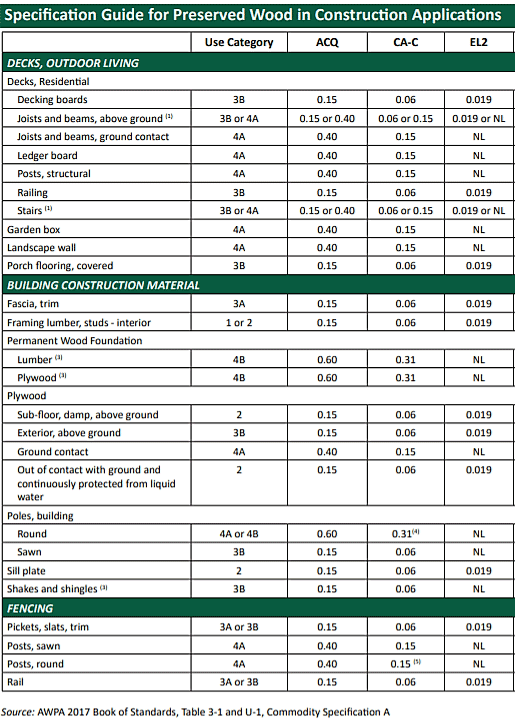 UC3B (above ground, exposed) – wood and wood-based materials used in exterior construction and not in contact with the ground. Materials do not require an exterior coating but may be finished to achieve a desired aesthetic appearance. Materials are used for a variety of applications in either horizontal or vertical positions such as decking, sills, walkways, railings, fence pickets, uncoated millwork and joists/beams for decks and freshwater docks. Examples are fence posts, deck posts, guardrail posts, structural lumber, joists and beams for decks and freshwater docks.